What an amazing place Siem Reap is -I definately rate it as a city to spend a lot more time in. The city centre is neat, compact and easy to negotiate, and also very beautiful. We met up with a group of people from the UK, Zee, Izzy and Norm who caused an absolute riot everywhere they went. Zee has a bright pink mohawk and Izzy an amazing dragon tattoo covering her back. 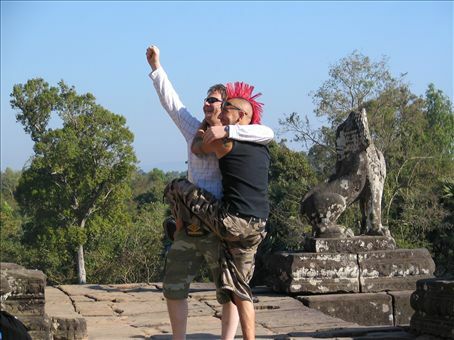 They were loving Cambodia, although Zee could not understand why everyone stared at them! Hamo is a bit templed out, but I just loved them and could have spent a lot longer there. I don't think I will bother with describing them - just put up a FEW pictures - they were just mind boggling. There were stalls at every temple selling drinks, food and handcrafts, the kids were enlisted to approach every tourist. We came forearmed with a bag of chocolate wafers which Hamish gave out (not the best idea considering the heat, but anyway...). I was asked at one of the more distant temples for some pens and pencils which would have been a much better thought. We also had a look at the floating markets, pretty similar to any other floating market you have seen, with people selling cold drinks and fruit meeting your boat. These were often kids, although sometimes women and their children - one such boat had a little girl of two or three with a python draped around her neck. I admired the python, and the next thing I knew, it was around my neck (eeuww!) Some of the younger kids had fashioned boats from tin basins and would paddle around the waterway. Three of them were playing a game which involved throwing coconuts at eachother to try and spill the others from the tubs. As soon as they saw a boat they would paddle furiously towards it to ask for money.